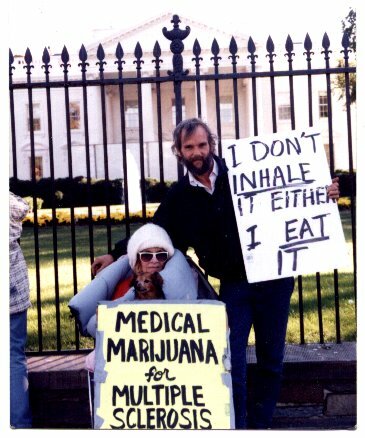 1997: Cheryl and Jim (and their beloved late dog Floyd, peering over the sign) at the White House on Cheryl's first Washington D.C. visit. 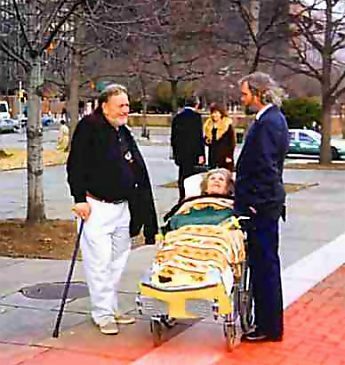 March 1999: After a hearing in the Action Class for Cannabis Therapeutics in Philadelphia, Cheryl and Jim talk with James Dawson. 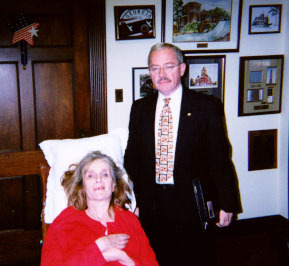 April 2000: Jim and Cheryl at the NJ Statehouse in Trenton, before driving off in an automobile caravan to see ex-Gov. 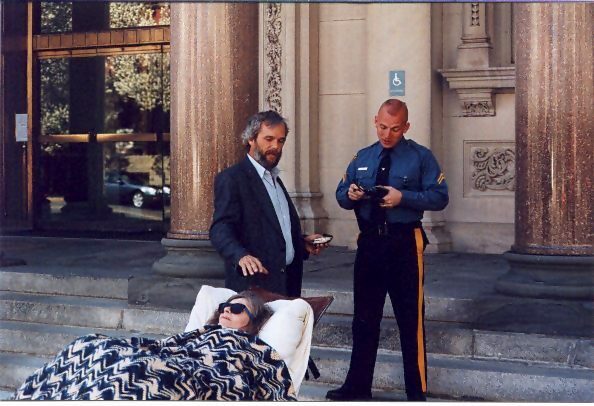 Christie Whitman at the governor's residence in Princeton, NJ 10 miles away. 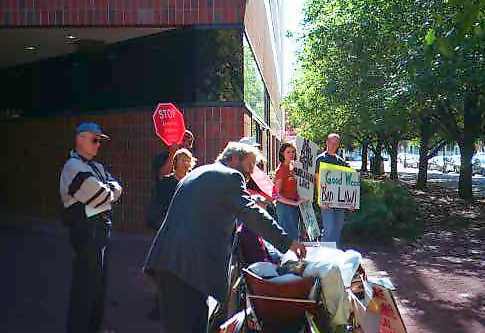 October 2000: Jim gives Cheryl a medicinal chocolate outside Al Gore's office in New Brunswick, New Jersey, as Dr. Steve Fenichel, Elvy Musikka, Diane Fornbacher and others look on. 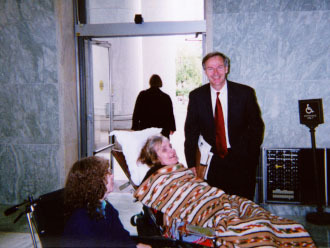 April 2001: Diane with Jim and Cheryl at the 2001 NORML Conference in Washington D.C.
After the conference, Cheryl and Jim spent three days lobbying on Capitol Hill. 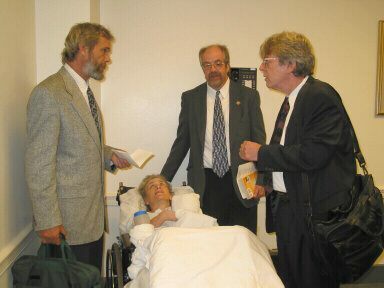 Reps. Ron Paul, Dana Rohrabacher, Jan Schakowsky and others. 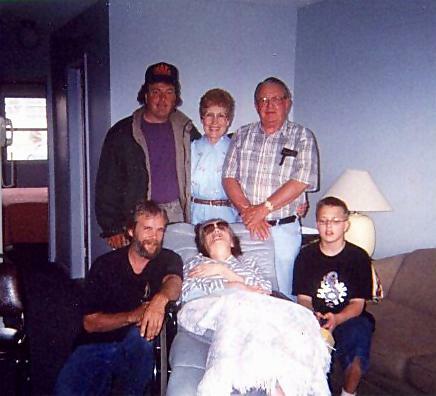 As it turned out, this was Cheryl's last trip to Washington. 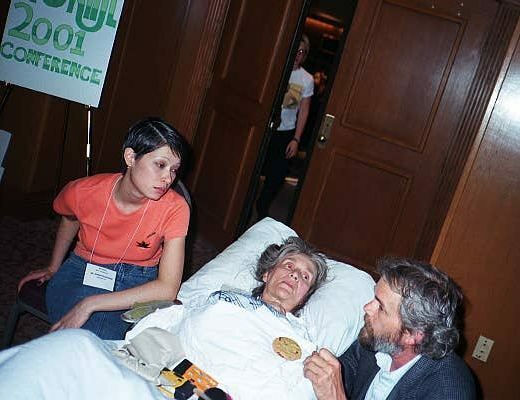 Photo from the last article about Cheryl including her last interview; ("I won't give up my fight for marijuana," she says, her words barely audible.). US NJ: Medical Marijuana Law Sought. 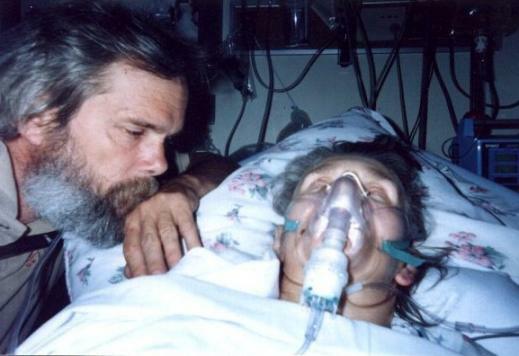 Tuesday June 3 2003: Jim and Cheryl in Cheryl's last photo. The end came 4 days later. 2002 was a very productive year for Cheryl, she starred in 3 videos! 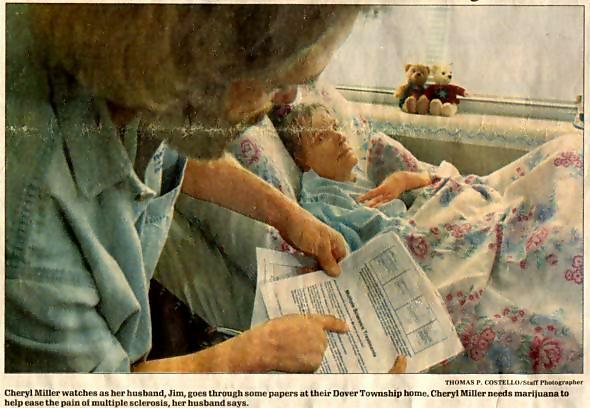 VIDEO: The Case for Cheryl Miller: Medical Marijuana Necessity (2002, Running Time: 29 minutes). VIDEO: WHY WOULD YOU DO THAT TO ME, BOB (BARR)? "This commercial is a scathing indictment of the most rabid Drug Warrior in Congress," -- former Libertarian Party Political Director Ron Crickenberger. Crickenberger produced this devastating ad for the LP's Carol Ann Rand, who ran against the Georgia Republican in an election in which the newly redistricted Barr lost the GOP primary to John Linder, sending him back to the private sector . 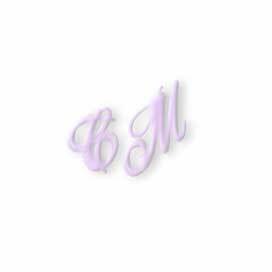 (2002, Running Time: 1 minute). VIDEO: Ed Thompson for Wisconsin Governor Medical Marijuana TV commercial with Cheryl and other patients in another Crickenberger-produced ad. (2002, Running Time: 1 minute).